This example shows how to process 3-D Lidar data from a sensor mounted on a vehicle by segmenting the ground plane and finding nearby obstacles. This can facilitate drivable path planning for vehicle navigation. The example also shows how to visualize streaming Lidar data. The Lidar data used in this example was recorded using a Velodyne HDL32E sensor mounted on a vehicle. Setup a velodyneFileReader object to read the recorded PCAP file. Each scan of Lidar data is stored as a 3-D point cloud. Efficiently processing this data using fast indexing and search is key to the performance of the sensor processing pipeline. This efficiency is achieved using the pointCloud object, which internally organizes the data using a K-d tree data structure. The veloReader constructs an organized pointCloud for each Lidar scan. The Location property of the pointCloud is an M-by-N-by-3 matrix, containing the XYZ coordinates of points in meters. The point intensities are stored in Intensity. The pcplayer can be used to visualize streaming point cloud data. Setup the region around the vehicle to display by configuring pcplayer. In this example, we will be segmenting points belonging to the ground plane, the ego vehicle and nearby obstacles. Set the colormap for labeling these points. The Lidar is mounted on top of the vehicle, and the point cloud may contain points belonging to the vehicle itself, such as on the roof or hood. Knowing the dimensions of the vehicle, we can segment out points that are closest to the vehicle. Create a vehicleDimensions object for storing dimensions of the vehicle. Specify the mounting location of the Lidar in the vehicle coordinate system. The vehicle coordinate system is centered at the center of the rear-axle, on the ground, with positive X direction pointing forward, positive Y towards the left, and positive Z upwards. In this example, the Lidar is mounted on the top center of the vehicle, parallel to the ground. Segment the ego vehicle using the helper function helperSegmentEgoFromLidarData. This function segments all points within the cuboid defined by the ego vehicle. Store the segmented points in a struct points. Visualize the point cloud with segmented ego vehicle. Use the helperUpdateView helper function. 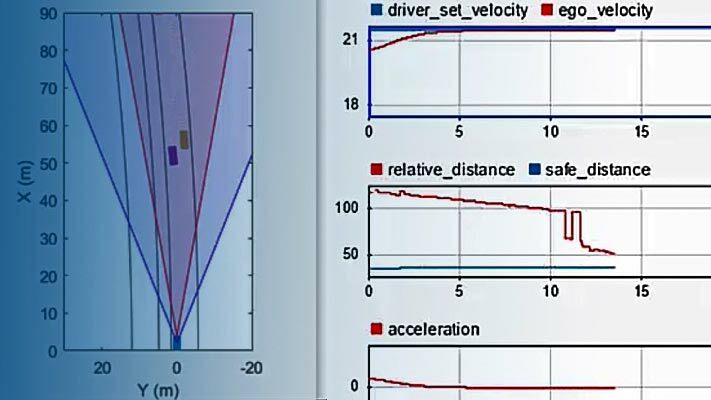 In order to identify obstacles from the Lidar data, first segment the ground plane using the segmentGroundFromLidarData function to accomplish this. This function segments points belonging to ground from organized Lidar data. % Visualize the segmented ground plane. Remove points belonging to the ego vehicle and the ground plane using the select function. Specify the 'OutputSize' as 'full' to retain the organized nature of the point cloud. Next, segment nearby obstacles by looking for all points that are not part of the ground or ego vehicle within some radius from the ego vehicle. This radius can be determined based on the range of the Lidar and area of interest for further processing. Now that the point cloud processing pipeline for a single Lidar scan has been laid out, put this all together to process 30 seconds from the sequence of recorded data. The code below is shortened since the key parameters have been defined in the previous steps. Here, the parameters are used without further explanation. helperSegmentEgoFromLidarData segments points belonging to the ego vehicle given the dimensions of the vehicle and mounting location. %   pointCloud object. vehicleDimensions is a vehicleDimensions object. %   Lidar in the vehicle coordinate system. helperUpdateView updates the streaming point cloud display with the latest point cloud and associated color labels.